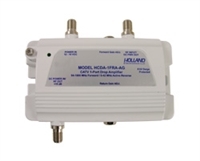 The HDA-1000 is a unique amplifier combining the features of our push-pull high output designs with a wide 1000 MHz range, making this amplifier applicable to CATV, off-air, wireless and RF data distribution. The “SMD” surface mount design insures reliability and performance at the highest frequencies. The HCA Series amplifiers incorporate high quality push-pull hybrid modules to provide the highest output and lowest distortion levels possible. A regulated power supply along with an extra large heatsink case provide the reliability required for operation in the most hostile environments. The HCA series is available in 30 or 50 dB Gain, 550 to 860MHz, and 120 or 220 VAC power (optional).. The HCA Series amplifiers incorporate high quality push-pull hybrid modules to provide the highest output and lowest distortion levels possible. A regulated power supply along with an extra large heatsink case provide the reliability required for operation in the most hostile environments. The HCA series is available in 30 or 50 dB Gain, 550 to 860MHz, and 120 or 220 VAC power (optional). The HCA Series distribution amplifier incorporates high quality push-pull hybrid modules to provide the highest output and lowest distortion levels possible. A regulated power supply along with an extra large heatsink case provide the reliability required for operation in the most hostile environments. The HCA series distribution amplifier is available in 30 or 50 dB Gain, 550 to 860MHz, and 120 or 220 VAC power (optional). 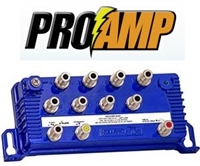 Our highest performance CATV Amplifier provides a two-way amplified capability with very low distortion from the use of two hybrid amplifier stages with inter-stage slope and gain controls. The variable controls in both directions make this amplifier ideal for use in larger MDU installations. The HCDA-1FRA-AG is the newest addition to our a high performance HCDA Series amplifiers, with the addition of adjustable gain for both the forward path as well as the return path to give you full control and flexibility with your system. The product case, and all of the ports are hermetically sealed to ensure no moisture comes in direct contact with the electronics. If you do not have power available in the location you are installing your system, you can use an HCDA-PI Power Inserter to remotely power the amplifier.. The FOD Modular Fiber Optic Distribution System consists of a 10-slot mounting rack for holding our modular fiber-optic power supplies, transmitters, amplifiers and receivers. The 8 3/4” rack height covers 5 EIA rack spacings, making the 10 module system space efficient. The FOD System has an LCD display for status monitoring, and modules can be changed in/out without power shutdown to the distribution system. The NE1100L optical node is the perfect solution for operators implementing fiber in their system. By using AGC/MGC, the NE1100L provides a stable RF output with a varying optical input. Features an optional return path transmitter and remote monitor module, along with hermetically-sealed housing and ports for excellent reliability in any environment. 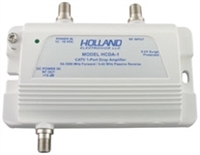 Holland’s optical transmitters offer great flexibility to meet the demands of today\'s CATV requirements. The NE1000 Series transmitters are ideal for offering a combination of analog and digital content. These transmitters utilize a directly-modulated 1310nm DFB laser diode and superior circuit design supporting automatic temperature and power control. Features include gain control (both AGC or MGC) for RF input level, and excellent linearity due to patented pre-distortion technology. The NE1000 Series transmitters are an ideal solution for today\'s medium sized CATV system offering a wide array of services. The NE6000L-* is a high performance optical amplifier designed for 1550 nm based network applications. This 19” rack mount module is ideal for long haul applications, fiber dense systems, and transport architectures such as broadcast layer transmission and redundant rings. Features high power output ranging from 14 to 24 dBm.